Unless you are a citizen of New Zealand, who may apply for a visitor visa upon arrival, you must have a visa grant before leaving for Australia. Depending on the passport you are holding and the length of your stay, the visa you apply for varies. Check the Visa Finder of the Department of Immigration and Border Protection for the exact visa type you should be applying for. Check out my blog post about the Australian visitor visa application here. There are four airports serving the entire Melbourne metropolitan area. As an international visitor, you will be landing at Melbourne Tullamarine Airport (MEL), the second busiest in Australia and the major hub for Qantas and Virgin Australia. If you are travelling from Adelaide, Gold Coast, Hobart or Sydney, you may also be arriving at Avalon Airport (AVV) via Jetstar Airways. There are also a handful of flights flying to and from the Essedon Airport (MEB) and the Moorabin Airport (MBW). Flying from the Philippines, you can count on Philippine Airlines and Cebu Pacific to fly you directly from Manila to Melbourne. Depending on the season of your travel, a direct economy roundtrip flight may cost you somewhere around PHP20,000 all the way to PHP50,000. Airfares tend to be more expensive during the summer - that's from December to February. Of course, connecting flights with layovers in Sydney, Singapore and Hong Kong are available, too. Bus: Skybus is good and easy way to get to the city. It costs AUD19 for a one-way ticket and AUD38 for a roundtrip ticket. Children are almost half the price. The service ends at the Southern Cross Station where complimentary hotel transfers are available. Taxi: Depending on the time of day, taxi fares start at AUD4.20 with increments per kilometer and per minute. For instance, a taxi trip from MEL to the Southern Cross Station at 12:00PM will probably cost around AUD58, inclusive of airport and tollway fees. Car Rental: There are several car rental companies available at the airport. Cost varies depending on the car type and the length of lease. Bear in mind that touting (i.e., being approached by a taxi or car hire driver for a ride) is illegal in Victoria. So, decline politely when offered. Ridesharing apps: There are a number of ridesharing apps available in Melbourne, namely Uber, GoCatch, InGogo and RideBoom. Take your pick! These are said to be cheaper than regular tax services. In order to seamlessly get around Melbourne, get yourself a myki card which you can use to hop on the train, the tram or the bus. Each card costs a nonrefundable AUD6, which needs to be topped up upon purchase. You may do so via a number of ways including the Public Transport Victoria (PTV) website and myki card vending machines. There are two types of myki - myki Money and myki Pass. If you're in Melbourne on an short trip, load up with a myki Money. But if you're staying for a longer period of time and travel often, buy a myki Pass so you can travel as many times as you wish in your chosen zone for the number of consecutive travel days you need. The myki expires after four years. So if you plan to visit Melbourne a couple more times, best to register your myki online so you can still use it again the next time you're in town. It’s also best to download the PTV app to map out your transportation options in real-time. Tram: Melbourne is one of the cities in the world that has an extensive tramway network. It even has a free (I repeat, free) City Circle route (Route 35) that operates within the Central Business District and passes by major tourist attractions. Train: As an alternative to the trams for farther destinations, such as the Brighton Bathing Boxes, the train is, probably, your best option. Default full fare will set you at a minimum of AUD4.10 per way. Buses: Being a major mode of transportation, buses are always a great way to see a city, especially Melbourne. Taxi and ridesharing apps: With the efficiency of the public transport in Melbourne, it’s hard not to make use of them most of the time. But it certain circumstances, cabs and ridesharing apps like Uber and GoCatch are available anytime of the day. The Australian Dollar is the currency used in Australia, symbolized as AUD. Know the latest exchange rate with your home currency here. Only Type I is used in Australia and it has no alternative plugs. So, plan accordingly. 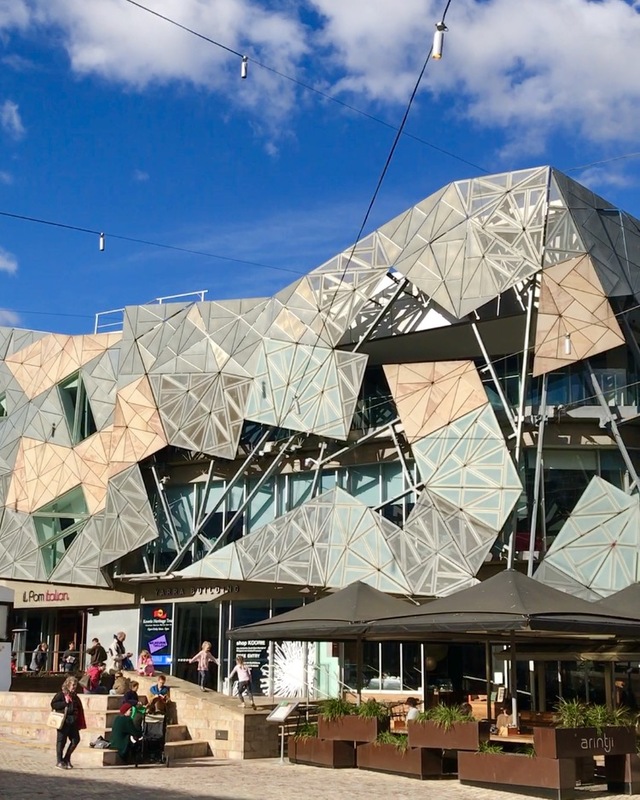 Let Melbourne introduce herself at the Federation Square, home to the Australian Centre of Moving Image and the National Gallery of Victoria. Just across the street is the Anglican St. Paul’s Cathedral. And while dining al fresco at nearby restaurants, you’d probably be in for a treat with a street act of any sort. There are so many things happening at the Square all at the same time, so you better keep up! You can take the train and alight at the Flinders Street Railway Station – a tourist attraction in itself, by the way. Alternatively, you can alight at Federation Square/Swanston St #13 tram stop, which is part of the Free Tram Zone. The square is free to see. 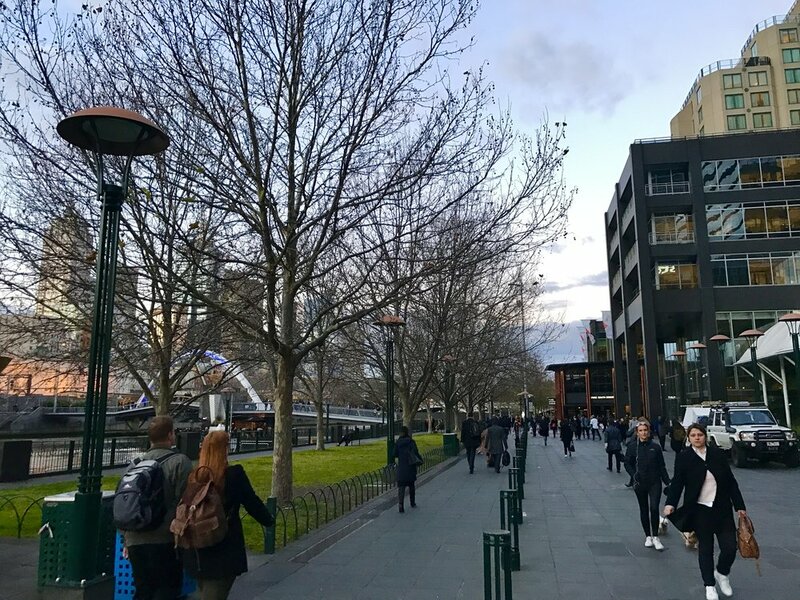 Cross the Yarra River to take an afternoon stroll at the Southbank Promenade to get a picturesque view of the Melbourne CBD. There are a number of restaurants lining the promenade, leading you to the Crown Casino and Entertainment Complex. While at Crown, don’t miss the chance to try the “world’s best margherita pizza” at 400 Gradi. Make sure to book a table at least a day before because it’s always a full house. The Southbank Promenade is free to explore but dining costs vary, of course. The Eureka Tower is the tallest skyscraper in the Melbourne CBD. Get a bird’s-eye view of the metropolis at the Skydeck 88 or a suspension experience on a glass cube fully extended over the edge of the building at The Edge. The nearest tram stop is Casino/Southbank/Queens Bridge St stop – a short 5-minute walk away from the tower. Entrance to the Skydeck 88 costs AUD20 for adults and AUD11.50 for children aged 4-16 years old. The Edge tickets will cost AUD12 for adults and AUD8 for children. Grab your brunch at the Queen Victoria Market where you can try various eats – from Souvla to Escargot pastries, from latte to sugar cane juice. Pick from a variety of souvenir items to remind you of the trip at the general merchandise section. This place is nothing short of street performers, too! Alight at the Queen Victoria Market/Elizabeth St. tram stop. The market is free to visit but cost of purchases varies. 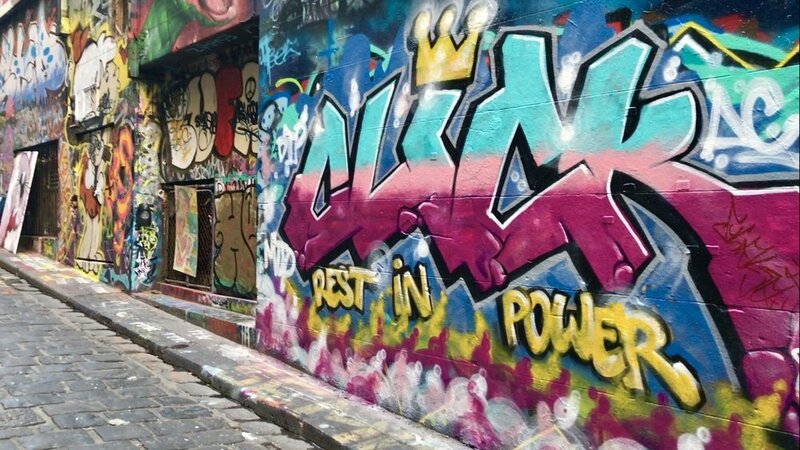 Melbourne is full of laneways leading to hidden city gems but the Hosier Lane is probably the most popular of them all. Take as many photos as you – and your phone’s storage – can against the edgy graffiti walls for your newest profile picture. This laneway is just a stone’s throw away from the Fed Square and it’s absolutely free! After tiring at Hosier, fill up your tummy at the Centre Place – another popular laneway lined with restaurants, cafés and bars. Taking the tram, you may alight at the Elizabeth St/Collins St stop. Free to see with cost of food varying. There’s probably no better place to watch the sunset in Melbourne than at St. Kilda Beach. Let the golden light cast upon your face as the day finally ends in the Southern Hemisphere. If you have a few hours to spare, this is a perfect place to have a small picnic. The Esplanade 136 is the nearest tram stop – which is already outside of the Free Tram Zone. The beach is totally free to enjoy. 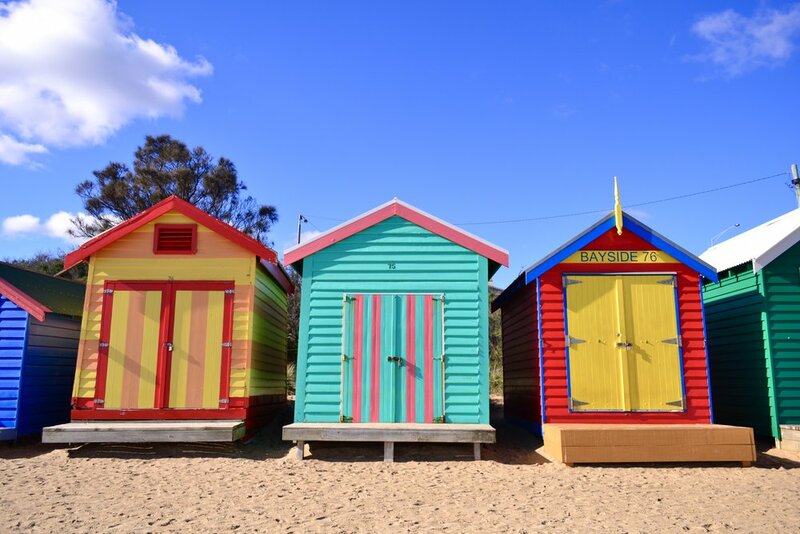 Another must-not-miss in Melbourne are the iconic Brighton Bathing Boxes fronting Philip Bay. It’s interesting to know that these 82 bathing boxes have stood the test of time (and nature) having been built over a century ago. Taking the train and stopping at Middle Brighton Station, a 15-minute walk passing by a quiet neighborhood will take you to the shores. Interestingly, the Brighton Bathing Box Association website (yes, they have an association) says that the boxes are not available for rent. But of course, snapping away with the boxes is absolutely free. Take some peaceful time at St. Patrick’s Cathedral. This Roman Catholic cathedral is the seat of the Archbishop of Melbourne and is known to be the largest church in Australia. Albert St/Gisborne St. tram stop 11 is the closest to the cathedral. After touring around the city, you deserve some good food at Vapiano at Flinders Lane. 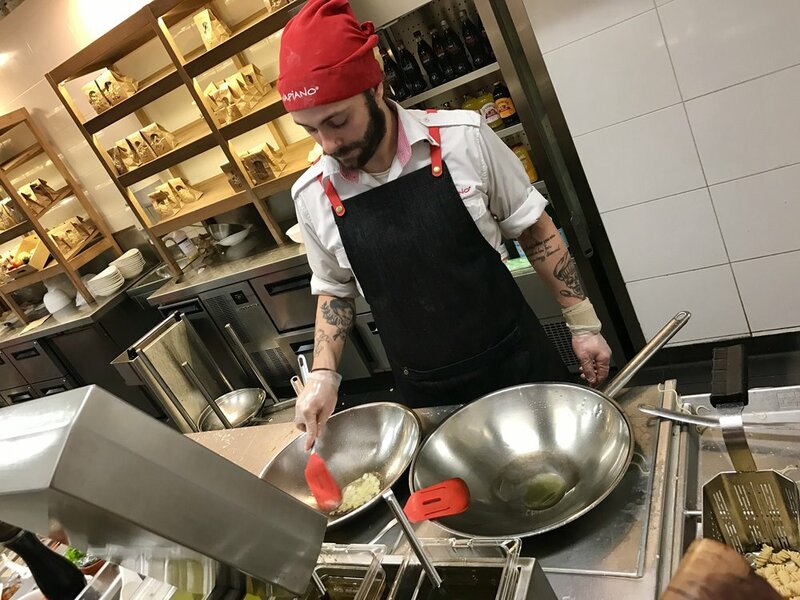 It is a casual and relaxing 250-seater Italian restaurant where you’ll find the chefs preparing your food in front of you at the pizza, pasta or salad stations. A card will be handed to each customer on which all individual orders will be charged, so you won't have to worry about splitting the bill afterwards. Vapiano is a few blocks away from the Flinders Street Railway Station. Setting aside the controversy of where did it truely originated, never leave Melbourne without your flat white. Almost all cafés in Melbourne serve flat white so finding one won’t be a problem. Though flat white is not on their menu, Dukes Coffee Roasters, also at Flinders Lane, probably makes it to most of, if not all, the best-cafés-in-Melbourne lists. There’s not much seating available at this café, though. You can find it close to the Centre Place. Ready your wallets as you’re in for a retail extravaganza starting at Collin’s Street, particularly the area near Collin’s Place. Designer brands line up the streets offering handbags, clothing, footwear – name it, Collin’s has it. The Crown Casino and Entertainment Complex is also a shopping hub with a wide variety of boutiques and shops to choose from. An alternate to these upscale stores is the Direct Factory Outlet (DFO) at Southbank where you’ll find the best deals from shoes to apparel, from bags to fragrances. It’s a short 8-minute walk from Crown trailing the Yarra River and passing by the Melbourne Convention and Exhibition Centre. For more affordable buys, head to Queen Victoria Market where you can find clothing along with souvenirs. The general merchandise section is properly segregated from the fresh produce and meat sections. So there's nothing to worry about.